It is a dream of every guy out there to have a dream job but it takes years to get that one and settle in it. In this phase of struggle they usually land up in jobs they don’t want to do or get better opportunities after some time. Soon they start feeling the need of changing the job. But leaving the job is not as easy flipping the coin. Before Quitting that job they need to learn and understand more about the job quit procedures and legalities. A company works with coordination among the employer and employee. You are a low-level employee or have responsibilities over your shoulder on your job, you are important to them. Quitting a job is completely the decision of employee and company cannot force him to work with them but it’s a loss for the company too. The abundance of it has been written on the legal obligations on the employee being fired but it’s less discussed about what if the employee quit his job. 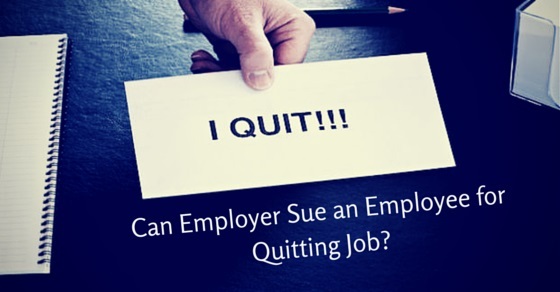 If you are quitting a job without notice to your company and if due to your resignation the company faces any loss, then it has the right to sue you. It’s the same as if a company dismissal its employee without a notice it has to pay severance to the employee it same goes with the employee resignation. It’s important to provide the company with the notice of your resignation in the form of resignation letter at least giving them sufficient time period to recruit and train someone new on your place. At least two weeks prior notice if you have been working with the company for less or equal to 3 months. Notice as per your deed if signed any. Notice of 15 days to a month if you have been working for more than 3 months in the company. If you had signed a contract while accepting the job you need to re-read it before quitting you job. Breaching your contract could put you into a big problem. So it’s important to check out the terms and conditions of the contract as going against it would give the employer a right to sue you and you would have to pay the penalty. According to this law, the employee is not allowed to use the confidential information of the company or the affiliations created during his employment in a deleterious way to his employer. Doing so is considered as unfair and culpable. Breach of this law would end up you sued by the company with high penalty and punishment. In case your resignation brings the company some loss or damage to its assets, investments or property, it can sue you for that damage. But a point here goes that if your resignation is without any notice only then you become liable for the loss. So be sure that your resignation does not harm your company and you are resigning at a safer place. Leaving the job has many reasons to go with but it’s good to leave that job with good memories. Such negligence could indulge you in a serious problem. So it’s better to take safer steps and move ahead in your career. How to Quit Your Job Nicely? Quitting that job in much graceful way would be good and helpful to you. When you’ll be moving to a new job the first question you’ll be facing would be of your previous job, your experience and reason of quitting. Some companies even demand for character certificate from the previous company or would consult your last company to know about your working and behaviour. So to land up into a good company you need to have goodwill in your last job. Losing your last job in conflict with the company would not get you anything. Before handing him you resignation letter, go to him and talk about the problem. He is your boss and understands the importance of employee morale, so he would not force to do the work you don’t want to because it’s of no use to him also. So have some words with him, explain your reason of resignation and be thankful to him for the support he provided as a boss in your job period and expect that he would understand your point and be supportive. Your resignation news would bring you many offers to stay back in the office. Now the decision comes to you whether the counteroffers or the promotion is the only thing you wanted or something else. Usually, these offers are so tempting that people settle up changing their mind of quitting but sooner realize that they didn’t need this. They really needed a change. So it’s good to be firm about your decision and have polite no. A sooner No is better than a later regret. Providing them with sufficient time to recruit a new person for the job you’re going to leave so that your resignation doesn’t bring harm to their company and you can respectfully leave job with a good farewell from the company. Talk to them about the time they need if still they ask for extra one week be generous to provide that, but be firm on your decision too. Do not compromise with your principle decision. Before quitting the job, being professional it’s your duty to return back all the documents, files and folder to the company. Also, it’s important to bring in the knowledge of the company about every client you had been handling and make them update about the work you were doing. This would give you graceful feedback from the company even when you’re quitting. Even after quitting never, bad talk about your boss or manager with someone from the same field because it would only get you bad points and you would lose your goodwill too. Maybe in future if you ever need his recommendation you would lose that at that point. At the exit talks with the colleagues or from anyone around never talk about the managerial skills or any skill of your former employer or boss. It’s better to be diplomatic saying” I got a better opportunity” or “I wanted to grow in career and this was a better option” or just that you needed a change now. This would maintain your goodwill and backup company always on your list. The news of resignation would bring you loads of work, sometimes ignoring expressions or hasty words. But be brave and calm. Work on your principles and face them without fear. Let them do what they want to because it’s the last they can. So be kind to them anyway. What Can An Employer Sue An Employee For? Employment is a very important factor in leading a successful life. Being employed is an essential part of one’s life which gives them confidence and facilitates to head their lives happily. Moreover having a full-time permanent job is a boon in disguise, especially in this competitive market. The best part here is that it is completely your responsibility of how you want your career graph to move. If you are good enough and social at your workplace it can take you to great heights. On the other hand, it can also drop you down, if you do not abide by the workplace ethics. “No matter how good you are, you are always replaceable“- this is the famous mantra going on in the market. Even if you are the popular and best employee at your work, you can never be sure that your employer will never fire you at any point of time. Though there are employment laws which are more prejudiced towards employees but do not forget that there is a strong flip side to it too. There are few areas where an employer/company can expel or fire an employee by filing a case against them for the following reasons mentioned below. Being an employee of a company you must take care of the business etiquettes, professionalism to be followed in the organization. Make sure to be reasonable about your resignation and fair to the company. Like the company needs you, you need the company too. It’s good to look forward in your career or quit the work you don’t wish to do but take a way of dignity keeping your respect in the company. 3. Get their loss covered without expecting any generosity from them. 4. A legal obligation with your name. 5. The long wait of the decision. 6. Hinder you from working in the same industry for a period of time. 1. Read the legal documents you signed while joining the company. 3. Talk to your manager or senior employer about your plan (only if he is trustworthy). 6. Resolve out the issues of work before leaving the office. Employment laws play in favour of both employers and employees equally. Even though there are several things written about the legal deeds regarding the employment issue, there have also been many mistakes or myths which have been raised. Though the myths do not affect much but there are laws which take its turn when legal treaties are not followed by the employees. Here are few must known legal obligations which every employee must understand before quitting. In this way, you could easily leave your job and be saved from getting sued up by your boss. Although many employers don’t go for sues and obligations but you never know when the table turns and you get into the shock. So its always better to move a step ahead of the problem. It’s all about how smartly you take decision and work for your future. Previous articleCan Employers Sue an Employee for Negligence?